Rushad Eggleston, AKA Rusharguanox Grimblestein AAKA Ushard Imbleston, delights the senses and expands the mind with his far flung tales of Sneth and Jick and Thurrowogoufnees. Besides being a worldrenowned virtuosic cello innovator, he is a lyric poet, kazoo master, guitar shredder, and galavanting banjo clumper extraordinaire, who is becoming quite famous on the internet. Many consider this gently fierce man a Wizard. If so it be because he has been evolving forth from Snee Goblin to Sneth Wizard. Nothing can compare to seeing him in person give his 337% committed musical sermons of infinite glee, covering topics rarely imagined by even semi mortals. Indeed, he eats topics, and makes them into topical ointments for the healing of your worldworn imagination-that-used-to-be. Do you dare to think the unthinkable? Do you dare to support a truly original rebel artist jester antelope of mind melting capabilities? Then come forth, brave squirrel, and be amazed. 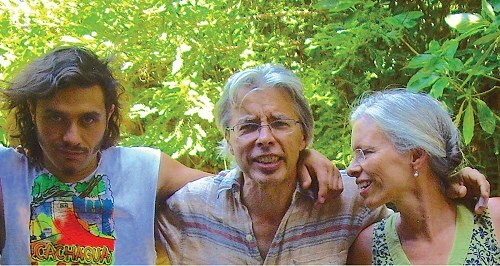 2 unique and deeply affecting musicians: Legendary fiddler and multi-string master Darol Anger focuses his talents in service of the singer-songwriter’s art. Emy Phelps is a standout artist in a large field: a prolific songwriter with a riveting voice which plumbs the deepest emotions. A musician of note in the Pacific Northwest, she has made a 30 year music career while raising 3 sons and a daughter. She worked in Theatre and Special Education, and toured for 7 years with Brian Ransom’s Ceramic Ensemble. These 2 musicians bring out each other’s special ability to convey deep emotional resonance combined with a bit of hot pickin’, and have 2 CDs and numerous major music festival performances to their credit.